Predicted path of the asteroid shadow. Shortly after 2:06 am EDT on March 20, 2014, observers between the red lines have the best chance of seeing the bright star Regulus temporarily disappear as asteroid (163) Erigone passes in front of it. Click on the map for a more detailed view of the path from Long Island and New Jersey to southwestern Quebec. Your help is requested to observe and time a rare and beautiful astronomical event! On March 20, 2014 shortly after 2:06AM EDT (that’s early Thursday morning, so be sure to set your alarm when you go to bed on Wednesday night!) anyone standing outside under clear skies and looking to the west in a large swath of New York State (ranging from Long Island and New York City all the way up to Oswego and Watertown) as well as portions of New Jersey, Connecticut, and Ontario (and on the island of Bermuda as well) may see the bright star Regulus completely disappear from view for as long as 14 seconds as the asteroid (163) Erigone passes in front of it. An event like this is called an occultation, and the web page you are now reading will try to provide answers to some basic questions along with information on how you can observe and contribute to the scientific study of this exciting event. The scientific community wants your help, and by reporting your observation (even an “I did not see the star disappear from my location” report) you will be adding to the scientific knowledge about this asteroid. Also, please follow and like the Facebook page for this event, www.facebook.com/Regulus2014 where last-minute weather updates will be posted. Update 21 March: Weather across New York State appears to have foiled all attempts to observe the occultation in or near the path, with the possible exception of an observing team that went to Bermuda on Wednesday. Talk about bad luck – a whole week of beautiful clear skies, and then one cloudy night at just the wrong time. Oh well, doing real science is like that – you do your best and take what comes. IOTA is grateful to every one of you for your efforts. We hope you will participate in upcoming events for which the star might not be quite as bright as Regulus but still easy to see in a small telescope, or even try some video recording with small sensitive cameras. There are hundreds of interesting asteroid events each year, plus many Lunar occultations which require no travel (the Moon’s shadow is bi-i-ig!) Stay tuned and please do stay involved. Update 16 March: Live broadcast! Several observers have indicated they will be attempting to broadcast live on Ustream during the event from various locations. Also, SLOOH has indicated an interest in re-broadcasting one of our live feeds. So stay tuned for details. The Ustream channels currently planned to be live at various times before and of course during the event are named ‘regulus-occultation’, ‘erigone occults regulus’ and ‘shadow-chaser’. If any more come online we’ll post their names here. Update 9 March: A free iPhone / iPad app for timing the occultation, “Occultation 1.0”, is now available in the Apple App Store here . A short YouTube video on how to use the app can be seen here . More experienced observers are still encouraged to use video-recording and UTC-linked apps if possible, but this app should make it easier for less-experienced or first-time observers to participate. Looking Southwest on March 20, 2014 just after 2:06 am EDT. 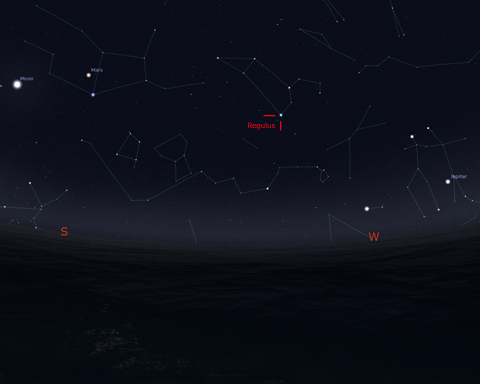 Regulus is the bright star marked on the chart by the two red lines. Regulus is in the constellation of Leo, just below and to the left of the curved star pattern commonly called the “sickle of Leo.” Chart generated by Stellarium. Click on image for larger view. What will happen on March 20, 2014 around 2:06 am EDT, and why is it so special? At what time should I begin watching or recording the star Regulus? If I go out, how can I be sure I’m looking at the right star (Regulus)? Is this Asteroid going to come anywhere near Earth? Can Science Teachers use this event to help teach STEM (Science, Technology, Engineering and Math)? Will we learn anything about the star Regulus from this event? Where can I look for more details? How can I best time the event? How do I report my observation? How will I know IOTA has received my observation? Will IOTA share its results with me? What is the best source of time to set my watch accurately? Have there been other public campaigns to observe occultations of stars by asteroids? From where can this event be seen? Will I need special equipment to see the star? How will I know if I can see this event? What if I live far from the predicted path? Is there someplace I can go to be certain I will see the event? Why should observers spread out instead of placing themselves just along the predicted center line? For how long a time will the star disappear? Where should I go along the path for the best chance of clear weather? What if I’m an amateur astronomer with no previous occultation timing experience? How can I join IOTA? How can I donate to IOTA? How does a Video Time Inserter work ? The ~45-mile-wide asteroid Erigone will pass in front of a very bright star (Regulus). The star is easily visible to the naked eye from all but the most light-polluted areas. Since the asteroid is much too small and dark to be visible, for people standing in the path of the asteroid’s shadow one of the brightest stars in the sky will simply seem to disappear from the sky for up to 14 seconds. Astronomers have been predicting occultations of stars by asteroids for almost 40 years, and Regulus is the brightest star to ever be predicted to be occulted by a sizeable asteroid anywhere in the USA. So it really is likely to be a once-in-a-lifetime experience for most who live within the path. Since Regulus is about 4 million times farther away from us than the asteroid, you can imagine that many factors need to be properly aligned for this event to be visible from our planet. First the asteroid must pass in front of the star. Then the shadow of the asteroid must fall on Earth in an area where it is night, and of course the sky must be clear (frequently not the case in March in the Northeast part of the USA). Next the orbit of the asteroid and the location of the star must be known with sufficient accuracy for the prediction of where on Earth the shadow will pass to be made with some reasonable amount of certainty. (For example, a prediction that said the shadow would pass “somewhere over the continental USA on March 20th” would probably not be worth getting out of bed for!) IOTA makes every effort to use all available information from NASA and other sources to make our predictions as accurate as possible. The prediction for Erigone and Regulus is expected to be extremely accurate. For many people, viewing the occultation of Regulus may be a once-in-a-lifetime event, similar to a solar eclipse but of a more subtle nature. Regulus is easy to see in the sky “naked eye” and you have probably seen it there many times without even knowing it. We usually have to wait many years before any particular asteroid passes in front of a star bright enough to easily be seen without a telescope. The temporary disappearance of a star as bright as Regulus behind an all-but-invisible asteroid is thus a rare and beautiful occurrence. Here is a link to a google map version of the IOTA path prediction: Erigone/Regulus Path Google Map . You may drag and zoom on this map as you would on any Google map. The map shows a green line, two blue lines and two red lines. If the asteroid’s shadow followed its most likely central path (the green line) exactly, it’s edges would follow the two blue lines. However since there is some uncertainty in where the actual central path will go, the red lines identify a slightly larger zone in which there is a 66% probability that the edges of the shadow will pass inside (the 1-sigma uncertainty zone). On the night of the occultation at any time from 1:30am EDT until the occultation, an easy way to find Regulus is to face the Moon and stretch your arms out horizontally to each side. Now turn your head to the right and sight along your right arm; Regulus will be directly above your right hand, about the same distance above the horizon that the Moon is above the horizon (that is, both will be about halfway from the horizon to directly overhead). Regulus will be the brightest star in that part of the sky. The star Regulus is in the constellation Leo (the Lion), which will be in the western sky at the time of the occultation. Click here to view sky charts for areas with different amounts of light pollution, from the worst city lights to the darkest suburbs. You should not have to worry about trees blocking your view since Regulus will be about 40 degrees above the horizon (about half way up measuring from the horizon to straight overhead). However, we recommend that you practice beforehand with someone who is familiar with the sky so that you will be certain of where to find Regulus. Pointing it out with a green laser pointer helps make absolutely sure that everyone in your group is looking at the correct star. Regulus will be the 5th or 6th brightest star in that area of the sky so you should have no trouble seeing it if the weather cooperates. Several landmarks (skymarks?) like the Moon, Mars and Jupiter will be in the sky nearby to help you get oriented as well. It couldn’t be a better fit! The event demonstrates several fundamental scientific concepts, among them that asteroids exist, that they orbit the Sun along predictable paths, that they occasionally pass between us and extremely distant stars, that light travels in straight lines, and that the amount of time that the star disappears behind the asteroid is related both to the size of the asteroid and to the speed of its movement through our sky. Plus, seeing a star disappear and reappear like this is totally cool! The amount of time for which the star disappears is also related to which part of the asteroid passes between your eye and the star. Since (as with many of us) an asteroid’s middle is typically its widest part, an asteroid’s central area passing in front of the star usually results in the longest occultation, while occultations near the asteroid’s edges result in shorter disappearances. Where you happen to be standing on Earth when the shadow of the asteroid passes over you determines what part of the asteroid the star will appear to pass behind. Physics teachers will no doubt find lots to discuss with their students here. No. The asteroid Erigone is in a stable orbit over 100 million miles from Earth in the Asteroid Belt and is in no way a danger to us. IOTA is the acronym for the International Occultation Timing Association. With our worldwide sister organizations (in Europe, the United Kingdom, Australia/New Zealand, Japan, S. Asia/India, Mexico, Latin America and South Africa) we sponsor online Internet discussion groups and provide free occultation predictions and planning and analysis software. Observers are in contact with each other frequently, planning for the next occultation expedition or sharing ideas on new equipment, software and new techniques. IOTA and several of its individual members have web pages loaded with occultation information and methods, tips, software, predictions and results of observations. The main IOTA webpage is www.occultations.org . Our Yahoo discussion group can be found at http://groups.yahoo.com/neo/groups/IOTAoccultations/info and is open to all with an interest in this topic. A stellar occultation (pronounced “occ-kull-tay-shun”) occurs when the Moon, an asteroid or another planetary body passes in front of a star, momentarily blocking its light. You can see an example of a recording of an occultation of a star by an asteroid here. Occultations are fun to observe, but more importantly they provide important scientific data on the occulting body, the occulted star or sometimes both! It is exciting to watch a star vanish and return from behind a lunar mountain, or to see the star disappear for several seconds as an asteroid passes in front of it. For most occultations all it takes is a small telescope, tape recorder or camcorder and a shortwave radio to make valuable scientific observations to help determine the size and shape of asteroids and to aid in new discoveries about these mysterious objects, including some of the elusive small moons that orbit them. (Of course in the case of Regulus/Erigone, no telescope will be needed!) More information can be found at the IOTA web site and in the Sky and Telescope article here. If you would like to help an experienced IOTA member operate some mobile equipment, please join and post to the IOTA Yahoo Group and let us know of your availability. Asteroids are rocky bodies left over from the time of the formation of the planets in the early history of the Solar System. Most of them orbit in the wide gap between the orbits of Mars (the fourth planet from the Sun) and Jupiter (the fifth planet from the Sun). Because they are well-preserved remnants of the early Solar System their study can provide many clues to the origin of the planets as well as the processes by which planets might be formed around other stars. Since they tend to be dark and small (the largest asteroid, Ceres, is only 950 km, or 590 miles, in diameter) asteroids themselves are typically not visible without a telescope. Timing their occasional occultations of background stars turns out to be a surprisingly useful and cost-effective way to study them. The shadow of the asteroid will be slightly larger than the asteroid, oval shaped and about 67 miles wide. (The difference in size is due to the shadow being projected on earth at an angle.) The asteroid’s shadow will be travelling from southeast to northwest across the surface of the earth at a a speed of over 10,000 mph – that’s about 3 miles per second! However, since the asteroid is so large that gives us about a 14 second maximum occultation near the middle of the asteroid, shorter nearer the edges. That’s plenty of time to be certain you saw the star disappear, should that occur at your location.The shadow will first touch land on the island of Bermuda at about 2:02 am Eastern Daylight Time (which will be 3:02 am in Bermuda since they are on Atlantic Daylight Time, one hour ahead of EDT). It will then race northwest across the Atlantic Ocean. (Cruise ships in the area might want to divert to somewhere along the center of the path and point this out to their passengers for a real special treat). About 4 minutes later, around 2:06 am EDT, the shadow will pass first over Long Island (both Nassau and Suffolk counties), New York City (all Boroughs), and western Fairfield and Litchfield counties in Connecticut, Union, Essex, Bergen and Passaic counties in New Jersey. It will then pass up the Hudson River Valley into the rest of New York State through Westchester, Putnam, Rockland, Orange, Sullivan, Ulster, Dutchess, Broome, Delaware, Schoharie, Albany, Cortland, Chenango, Otsego, Montgomery, Schenectady, Cayuga, Onondaga, Madison, Herkimer, Fulton, Oswego, Oneida, Hamilton, Jefferson, Lewis and St. Lawrence counties, and then finally follow a path between Belleville and Kanata, Ontario into Canada. Here is a link to the IOTA path prediction page the event: Erigone/Regulus Path Prediction and here is a link to a Google Map version of the path map. Weather permitting, the bright star Regulus is visible to the naked eye from almost everywhere, with places like Times Square perhaps being the exception. Being sure you are looking at Regulus and not some other bright star might be the bigger challenge from light-polluted areas where the dimmer stars around it might not be visible. To see the star disappear, you must be somewhere where the shadow of the asteroid will pass over you. (See links at the top of this page to the maps showing the predicted path of the shadow.) 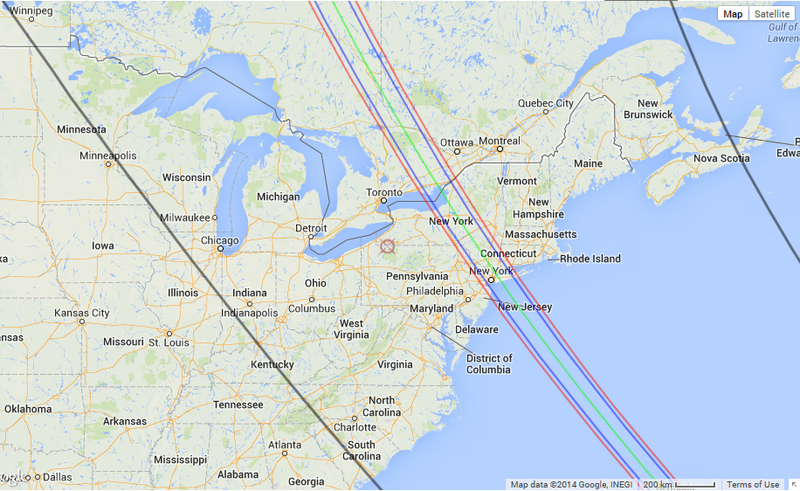 Now you simply need to find out if you can see Regulus from some location in the path. If so, and the shadow does in fact pass over you, then you will also be able to see Regulus disappear from that location on March 20th. So if you live in or anywhere near the predicted path, or plan to travel to the path, then sometime in late February or early March (or right now if you want) start trying to find a place where you can see Regulus between 1 and 2 am – it could be your apartment balcony, a park near your house, your back yard or your driveway. As long as its clear on the night of March 20th, that’s your spot! The free planetarium program Stellarium (available for Windows and Mac) can help you find where Regulus will be in the sky on that (or any other) date and time. If you live far from the predicted path, you could still discover a satellite of the asteroid Erigone! If you can’t travel to the path of the occultation of Regulus by Erigone, but you live in the large region between the two gray lines on the map below, including the Northeastern and Mid-Atlantic US, and much of the Midwest and eastern Canada, you can still make a valuable contribution by watching or recording Regulus for eight or nine minutes, since you could discover and measure a small satellite of Erigone. Erigone is not known to have a satellite, but dozens of other asteroids are known to have satellites, so there is a chance that one might be revealed from a brief occultation of Regulus. The duration of an occultation by a satellite depends on the satellite’s size; it could be anywhere from a brief blink, less than half a second, to as much as two seconds or more (if the satellite were large enough to occult the star for more than 3 seconds, we would probably already know about it from other high-powered astronomical observations). Since a satellite occultation could occur anywhere in the large wide region, observations by hundreds of people are needed to check the whole region around Erigone; your observation could be critical. Observers in the southern part of the zone, from Virginia and Delaware southward, should watch for a satellite occultation from 2:01 to 2:10 am EDT; those who live in the central region, from eastern Kentucky to Maryland and New Jersey, north to Chicago, southern Ontario, southern Quebec, and New England and the Maritime Provinces, should watch from 2:03 to 2:12 am EDT (1:03 to 1:12 am CDT, or 3:03 to 3:12 am ADT); and those in the northern zone, from Wisconsin, Minnesota, and southern Manitoba, and in central and northern Ontario and Quebec, should watch from 2:05 to 2:14 am EDT (1:05 to 1:14 am CDT). Of course, observers in the main occultation path could also have an occultation by a satellite of Erigone before or after the main event. 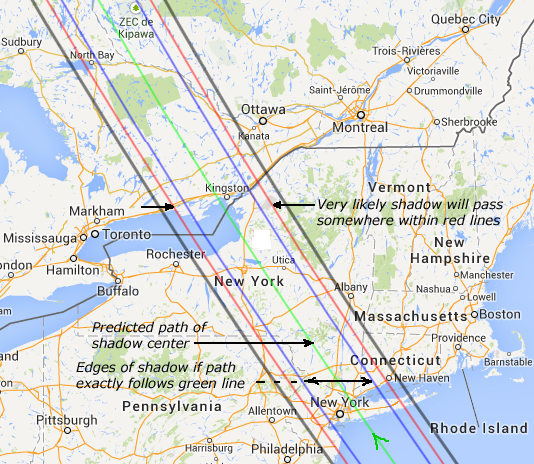 Any spot along the predicted center line of the shadow path has the highest probability of seeing the event. However we do not have perfect knowledge of the orbit or location of the asteroid Erigone or of the location of the star, so the actual center line of the shadow’s path may pass somewhat east or west of where it is predicted to pass. Since large deviations are less likely than small ones, anywhere along the predicted center line is the spot to go if you want the best chance of observing the event. Of course, you should check the weather and go to an area which has the highest chance of clear skies at the time of the event. This may require some hours of driving and even arranging for overnight accomodations in advance. If all of the observers were in fact lined up in a single line along the predicted center line of the shadow’s path, we would either get an extremely accurate measurement of just one cross-section of the asteroid or, if the entire shadow passed more than 45 miles east or west of this predicted line, no information at all! So our goal is to have observers spread out across the entire predicted path (plus a bit more) to make a large “picket fence” covering the “best estimate” path width and at least half of the path width again on either side. This way, no matter where the shadow ends up passing there will be many people who will be able to observe and measure it. Since we are not perfectly certain where the shadow will pass, no matter where it ends up going a lot of people will report a “miss”. However these “miss” reports are very valuable as they help define the exact edge of the asteroid shadow. (If you report a disappearance but someone a mile west of you reports no disappearance, we know the edge of the asteroid’s shadow must have passed somewhere between you – that’s very valuable knowledge!) So you may report a “miss” or a “hit” but either way you will be making a big contribution to science, as long as you do report your observation to IOTA. See below for how to do that. The maximum amount of time the star will disappear will be about 14 seconds for observers standing at locations where the star appears to go behind the central or widest portion of the asteroid. Observers east or west of this line will see shorter disappearances. (Your position north or south does not change the part of the asteroid behind which the star will appear to pass, it only slightly changes the time at which the shadow will reach you.) However the goal of this effort is to get observations across the entire body of the asteroid, not merely at its center line. Every observation is of equal value regardless of how long or short the occultation is from your location. Even an observation where you do not see any occultation is extremely valuable as long as you tell us (as all observers should) the exact location from which you were observing. Of course it is important that you are sure you were looking at the correct star! These are only rough guidelines. For a more exact predicted time of disappearance (which may still be off by a few seconds) for your location can be found in a table at www.asteroidoccultation.com/2014_03/0320_163_32317_Summary.txt by simply looking up the longitude of your location in the table. In the United States you should use the rows in the table in the range of -74 degrees (New York City) to -78 degrees (Canadian border). You can easily obtain the exact longitude of your proposed observing site at www.findlatitudeandlongitude.com . Remember that negative longitude is typically used to mean West of the Greenwich Meridian, while positive longitude means East of Greenwich, so negative and “West” mean the same thing (longitudinally-speaking). All of the longitudes where this occultation can be seen are negative (“West”). How do I report the results of my observation? The public reporting web page can be found here. It is in testing mode now but will be activated prior to the event. Feel free to try it out! IOTA provides predictions for events such as the Regulus occultation in order to encourage people to observe the event, but also encourages those who can do so to provide as much scientific information about the event as possible. Timing the event is the key to adding to knowledge about it. We maintain a database of tens of thousands of previous occultation observations and add more every day (or more accurately, every night). We encourage you to participate! While it is of great interest to simply observe this rare occurrence, the scientific community wants your help in learning more about the size and shape of this asteroid as well as improving our knowledge of its orbital characteristics. After all, nobody has ever visited the asteroid Erigone so we really know very little about it. Thus an “observation” (in the scientific sense) would be a report which you send to IOTA after the event that answers any of the following 3 questions. IOTA will combine your results with all other observations to improve our knowledge of this asteroid’s shape, orbit and rotation. The more people that provide observational data, the more knowledge we will gain – it’s that simple! Question 1 will be the easiest to answer. Question 2 requires a bit more effort and equipment but will give more accurate results. So here we go! Question 1: If you just visually watched the star, then tell us: from your observing location, did the the star disappear at all? Then, if it did disappear, give us your best estimate of the duration of the star’s disappearance. If you did not see the star disappear, please report a “miss”. You are probably saying, “Even my 7-year-old daughter can handle that” – and you are right! So here we are simply asking, did the star Regulus disappear for even an instant around the predicted time for your location (say within plus or minus 2 minutes of the expected time)? And, if it did, for about how long was the duration of disappearance? Your observation in this case would be a simple yes or no plus a time estimate, but it is important that you also know and report your location accurately even if the result is no occultation. The Public Reporting Page will let you easily tell us your exact location and the other information. Question 1 can be answered without any astronomical equipment at all other than knowing when the disappearance is predicted for your location, a star map and some practice locating Regulus in the sky, and a watch set accurately so you know about when to start looking intently at the star. Keep your eyes on the star, not the watch, and try not to blink – you might miss it! While a group “expedition” can be fun, remember that by spreading out across the path of the asteroid’s shadow we learn more than if you all stay in one place.You can answer this question on the reporting page here by clicking on the “Question 1” button. While Question 1 provides valuable information, Question 2 improves the scientific value of your observation. We encourage you to answer only whichever question you feel capable of attempting, but more accuracy with regard to time is always better. So if you feel up to it, let’s move on to Question 2. Question 2: If you timed or recorded the event using a stopwatch, a stopwatch app, or a timing app on a smartphone, then either (a) what was the duration of the disappearance of the star, or (b) what were the timestamps of the times of disappearance and reappearance. If you did not see the star disappear, please report a “miss”. Using a real stopwatch or a stopwatch app on a watch or smartphone to measure the duration of disappearance of the star, similar to timing a runner in a race. Everyone in a group can do this if each has their own stopwatch. Smartphone stopwatches are fine, however you have to be famliar enough with the app that you do not have to look down to operate the “buttons”. Practice in advance. Use an app which allows you to timestamp the actual times of disappearance and reappearance of the star. Examples would be “Occultation 1.0” for the iPhone/iPad, “Timestamp” by Emerald Sequoia (iPhone) or “TimeTheSat” (Android), all available for free. The latter two have the advantage that they sync themselves with USNO timeservers over the data network so they report their timestamps in UTC. However “Occultation 1.0” has the advantage that it reports your times and location to a server automatically. With “Timestamp” and “TimeTheSat” you will need to submit your times and location via the Public Reporting Page. Make an audio recording by having one person call out “IN” when the star disappears and “OUT” when the star reappears. You can play back the audio recording later and time the shouted “IN” and “OUT” events on the tape to identify the duration of disappearance of the star. Using a digital SLR camera or typical consumer video camcorder to record a continuous video of the star. You can then submit the video to IOTA so we can count the number of video frames in which the star is not visible. (If the star was not seen to disappear you would report a “miss”). Advance practice is recommended to be sure the star is easily visible on the recording. Manual focus will very likely be required to keep the star in focus. The R14DSLR page gives instructions on how to submit a test video in advance to IOTA to insure that your technique is valid and your video will be useful. If you video record: during your video recording, play onto the the audio track during the occultation some kind of sound synchronized with UTC. This could be a shortwave radio tuned to WWV, or a smartphone running Emerald Time (iPhone), Atomic Clock (iPhone) or Time The Sat (Android) with the “sound tick” option enabled. You should also read aloud into the DSLR microphone the actual UTC time reported by the app just after you start it. This will let us know what time is associated with each time tick. More information on this option is available here. If you video record: after you have recorded the occultation, then without stopping the recording just tilt the camera down and make a few seconds of in-focus recording of an app like Emerald Timestamp, Time The Sat or Atomic Clock on the video so we know how to adjust your recorded D and R times to UTC. This is done most easily by propping the phone up about 5 feet from the camera and swiveling the tripod down to focus on the phone’s screen after the occultation but without stopping the recording. Recording audible ticks at the same time if the app supports it is a good idea too. Read out the time into the microphone along with the phone for a few seconds too. An excellent summary of these various techniques can be found on the Royal Astronomical Society of Canada website here . Where can I purchase a Video Time Inserter if I want to make the most accurate measurements? Video time inserters can be obtained here. A Video Time Inserter coupled to a video camera or webcam, a small telescope and a digital video tape recorder (Canon ZR series, Elura etc.) or other digital video recorder. This arrangement puts a permanent timestamp accurate to the millisecond directly onto every video frame. Contact IOTA for assistance well in advance if you wish to try this approach and have no previous experience. These times, or the fact that you did not see the star disappear at all (also very important to know!) and your location should be reported using the Public Reporting Page. Use http://www.time.gov/widget.html (but note that if you have an old version of Java, you may need to use http://www.time.gov instead and click on the Eastern part of the USA map shown). If you need audio seconds markers, use one of the smartphone apps that offer audio “ticks” and synchronize their time with UTC by using the NNTP protocol, or use the NIST Telephone Time Service called from a land line. Cell phone transmissions are subject to delays and the time-of-day reported by most cell phones and smart phones is typically inaccurate by many seconds. Yes, in 1983, 1984, and 1991, but the stars weren’t as bright as Regulus, and/or the predicted path was not as well-known as the Regulus – Erigone occultation, so they were not very successful. You can read about them here. The web page for reporting all Public observations can be found at the Public Reporting Page. A confirmation page will be presented once your observation data has been transmitted and received by the IOTA servers. Yes, if you provide us with your email we will send you a notification when the results are posted. Yes! For advanced observers using telescopes and astronomical video cameras, one of the scientific objectives of measurements of the Regulus (Erigone) occultation is to measure the diameter of Regulus using the gradual transitions in light intensity that can be seen on video during the extremely short time during which the edge of the asteroid moves from one side of the star to the other, during both the disappearance and the reappearance events. These observers should plan to observe for maximum sensitivity to the star brightness, with good attention to not saturating the stellar image, using cameras that are known to provide linear brightness response, manual gain control, etc. If they are attempting multiple recordings they should try to have at least one non-PC164CEX-2 camera in the mix, as the internal manipulation of the pixel intensities in the PC164C-EX2 camera will distort the light curve.